I am the CS manager at Coradine Aviation, and we were wondering if there was a way to exclude our release notes from Auto-Replies Suggested Articles (what the customer gets as suggested helpful articles) and Search Queries. 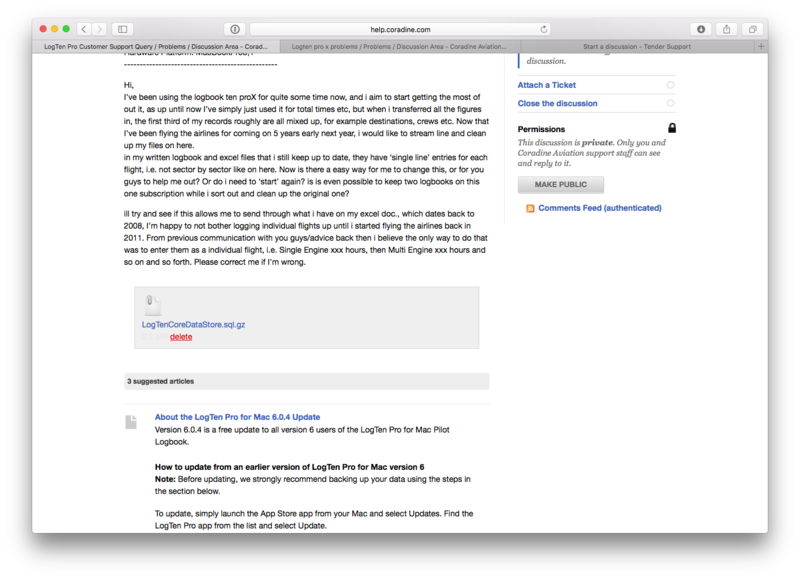 For example, in [this discussion](http://help.coradine.com/discussions/problems/120142-logten-pro-customer-support-query) the Suggested Articles lists our "About the LogTen Pro for Mac 6.0.4 Update" article, but clearly that would not be helpful (image attached). These also show up when conducting a search in our Knowledge Base. Any suggestions for excluding these? Apologies for the delay. Let me look into this with one of our devs and we'll get back to you asap. We don't support this right now, but I can suggest you use more keywords on other articles to push them up to the top of relevance. Are the release notes all in one category? brandi closed this discussion on 05 Jan, 2016 09:01 PM.